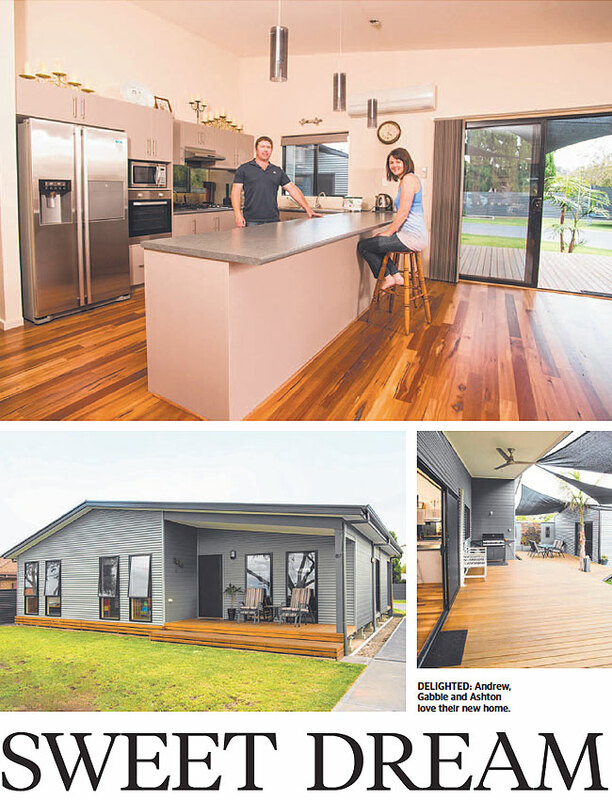 When Gabbie and Andrew Nottle decided to build with Sarah Homes, they had definitely done their homework. They had, after all, already built two homes, which meant they knew what they did and didn't want. "We learnt a lot from each build... each time we built from a basic plan and changed it," Gabbie says. The couple, who have a young son Ashton, 6, wanted Sarah Homes' Hayborough 155 design, again with a few moderations to suit their lifestyle. "We loved its beach house feel and didn't want an overly big home as we only have one child" Gabbie says. Particularly taken with the home's blend of corrugated iron and cladding, the Nottles decided to alter its roofline to allow for a raked ceiling. They also decided to customise the facade with feature windows. "We went with floor-to ceiling windows so that the front of the house didn't look so shed-like... our windows are narrower and evenly spaced," Gabbie says. They also cut back on the decking to allow for a larger dining section and customised the master suite by making it larger to accommodate another extra, a luxury walk-through his'n'her wardrobe. "We designed that ourselves... we like that we walk straight out of the ensuite and into our dressing area," Gabbie says. family and friends. "We built the kitchen the way we wanted it," Gabbie says, noting that guests love it along with the outside decking. A modern, neutral decor also complements the light-filled home which, Gabbie says, has a feeling of spaciousness. "We just love the whole home" I don't think there's anything we don't like about it," Gabbie says. "It's our dream home for what we need."